As part of the Netflix Canada #StreamTeam, you may have noticed I post at least once a month about awesome Netflix shows, and usually said posts have a theme. The theme for August is Adventures. The PR folks recommended a slew of great titles for little kids and for the first time ever, ALL the shows recommended were ones that have never streamed on our TV screen. So, it's been an adventure trying to watch something new with my preschooler who lives for routine (and rotating through the same episodes of Yo Gabba Gabba!, Bubble Guppies, Thomas and Friends, Sesame Street, Super Why! and Pingu). Right now, Hannah is obsessed with turtles. Well, at least her turtle shirt. Whenever we wash it she HAS to wear it the next day, so I thought for sure she would want to watch A Turtle's Tale: Sammy's Adventures. Me - "Hannah, do you want to watch a movie about a turtle?" Me - "Let's watch a movie about a turtle!" Me - "I would REALLY like to watch a movie about a turtle." So, August became and continues to be an adventure in trying to get Hannah to watch something new. As for Sammy, he's been added to MY List on Netflix. I really do want to watch A Turtle's Tale. I just want to watch Hemlock Grove slightly more. 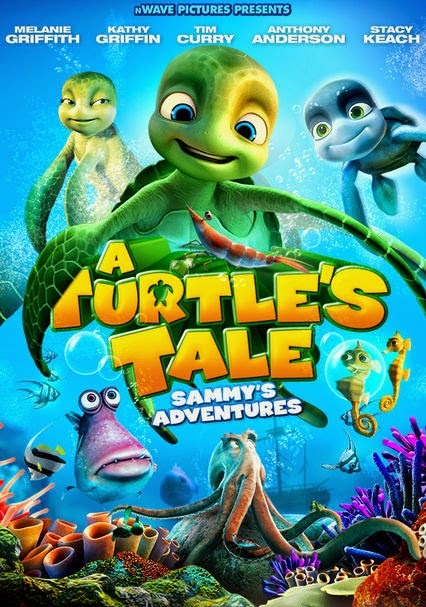 A Turtles Tale and the second one, which is about their grandchildren, are the cutest movies!!! We discovered them on Netflix too!